Although there are many issues that need to be dealt with in divorce situations, there are two basic themes. The first theme has to do with children, custody and visitation. The second theme has to do with division of assets, child support, spousal maintenance (alimony) and other financial issues. Men who have worked hard to obtain an excellent education and/or credentials and have strived and dedicated themselves to both their family and their employment initiatives, should not be punished in a divorce situation. I have worked hard to develop my business, how can I keep it? How do I keep my career, provide for my children, and not become a deep pocket to fund my wife’s exorbitant lifestyle? Fighting a complicated divorce can be similar to fighting a mini war. If negotiations and settlement attempts fail, each side prepares for a battle. This battle is called a trial. Our office helps our clients develop an effective strategy to preserve their assets, maintain relationships with their children, and not be devastated by the divorce process itself. 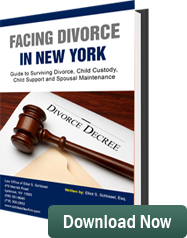 Approximately 5% of all divorce cases in New York go to trial. The other 95% are settled either before trial or at trial. It therefore is necessary to prepare for trial while continuing to negotiate to obtain the best possible results. A father’s love and devotion for his children is not second string to a mother’s love and devotion to her children. Under the law in the State of New York, both parents are considered to have equal ability to obtain custody of their children. Today, more and more fathers are stepping up to the plate saying “I want custody of my children.” Fathers are dedicating themselves to being in their children’s lives. The former standardized types of visitation that judges handed out in the past do not necessarily meet the father’s needs today. The standard in the State of New York as to who receives custody of the children is what is in the children’s best interest. Judges are forced to make these very difficult decisions. There is no standardized scale rating mothers and fathers for their talents involving child raising, emotional stability, and bonding with their children. There are standards within the statutes in the State of New York but they are general standards. In many situations, judges make decisions on who will receive custody based upon gut reactions that are thereafter qualified within the law. Children deserve the love, dedication and financial support from both parents. In some cases, joint custody arrangements can be worked out and the parents can amicably raise their children. However, this is not true in all cases. In some cases, the children are going to live with one parent and the other parent is going to visit! If you are a father and seek being more than a visitor in your child’s life, then you need the best, most dedicated, most experienced father’s rights lawyers to protect your interest. At the Law Offices of Schlissel DeCorpo our father’s rights attorneys have been delivering for our clients for more than 37 years.